Stars and planets that are typically only visible after sunset will be visible during the total solar eclipse on Aug. 21, 2017. This map shows where some of those stars and planets will be located relative to the sun and moon, as seen from Casper, Wyoming. During the total solar eclipse of Aug. 21, 2017, the moon will completely cover the disk of the sun, darkening the sky and revealing normally hidden features of the universe, like the sun's atmosphere. 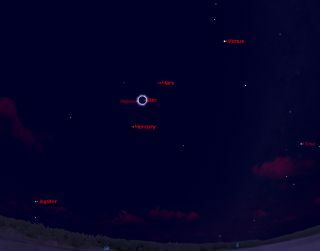 During this period of totality, skywatchers will also see stars and planets that are typically hidden until dusk or nightfall, in what just moments before had been a daytime sky. REMEMBER: Looking directly at the sun, even when it is partially covered by the moon, can cause serious eye damage or blindness. NEVER look at a partial solar eclipse without using proper eye protection. See our complete guide to find out how to view the eclipse safely. On Aug. 21, 2017, Venus, shining at magnitude -4.0, will be situated 34 degrees to the west (right) of the sun in the south-southwest sky. (Check this guide to learn about the scale that astronomers use to rank the brightness of an object — the lower the magnitude, the brighter the object, with a negative magnitude being brighter than a positive magnitude.) Your clenched fist held at arm's length measures approximately 10 degrees, so Venus will be found roughly "3.5 fists" to the right of the darkened sun. The next brightest object will be the planet Jupiter, at magnitude -1.8, which will be 51 degrees to the east (left) of the sun. If you're west of Idaho, however, you won't see Jupiter, because it will be below the east-southeast horizon. Mars will be quite close to the sun, only 8 degrees to the star's west. However, the Red Planet will also be shining at magnitude +1.8, making it a rather challenging object to glimpse with the unaided eye. Mercury will lie 10 degrees east of the sun, but that planet will likely be much too faint (magnitude +3.3) to see. Among the stars, Sirius, the brightest of all (magnitude -1.4), will be glowing low in the southwest. And situated a mere 1.2 degrees to the upper left of the sun will be Regulus (magnitude +1.3), the brightest star in Leo. If you don't see this star with your unaided eye, you almost certainly will see it if you train binoculars on the obscured sun to admire the jets and streamers of light that make up the sun's outer atmosphere, the corona. (Check out our safety guide to learn how to safely view the eclipse with binoculars.) Regulus should also be rather conspicuous on wide-angle photos of the obscured sun. As seen along the entire eclipse path, Venus will probably become quite evident to most eclipse watchers a good 10 minutes or more before the onset of total eclipse. As the crescent sun grows slimmer and slimmer behind the progressing moon, Sirius and Jupiter may come into view. During totality, stars down to about magnitude 1 should also be visible. A few fainter stars, of magnitude 2, might appear here and there, but the light of the corona as well as the general scattering of light around the sky will likely squelch the rest of the stars. This eclipse will give you a fine opportunity to gauge the brightness of the sky, because during totality observers will be able to briefly see the stars and constellations that are visible at night during the opposite season – that is, late February. George Lovi (1939-1993), a long-time popularizer of astronomy and the night sky, once wrote, "One solar eclipse activity I hope to see less of is the sometimes-ridiculous effort to hunt down stars and planets during totality. Some devotees spend virtually all those precious minutes searching! I can't, for the life of me, imagine how this compares to the main event. And I speak as a lifelong aficionado of observing out-of-season or otherwise 'strange' stars." I tend to agree with George. While it's fun to watch bright planets and stars suddenly pop into view during totality, you would probably do better to spend a good part of those precious moments concentrating on what George was alluding to as the "main event" (the solar corona). Even those who have detailed experiments planned out in advance sometimes find themselves helpless under the spell of the totally eclipsed sun. It's difficult for cameras to capture the lighting conditions during a total solar eclipse, but this snapshot taken from an airplane during totality shows that the sky does not go completely dark once the moon completely covers the sun. "At totality, the sky's darkness resembles the night sky under a bright full moon." When I read descriptions like this, I immediately know that the people who wrote those words have never experienced a total eclipse for themselves. In doing their research, they no doubt discovered that the light of the sun's corona is roughly equivalent in visual intensity to that of a full moon. So, they concluded that with the corona providing the only source of light in the eclipse-darkened sky, that the sight will resemble a night sky under a full moon. That, however, is not the case! If humans lived on a planet without an atmosphere, then such a comparison would be viable. However, Earth's atmosphere brightens the sky significantly even during the darkest stage of total eclipse. For the same reason that it does not get instantly dark the moment the top edge of the sun disappears below the horizon — the effects of twilight keep the sky reasonably bright for 30 or 40 minutes after sunset — the sky remains similarly bright during totality. On Aug. 21, the moon's shadow will be an oval of darkness projected on the surface of the Earth; as this shadow tracks across the United States, that oval will measure roughly 65 by 70 miles (105 by 113 kilometers). If you were situated right in the middle of the shadow's path, then during the middle of totality, the oval's outer edge would be at most 35 miles (56 km) away. Beyond that distance, the sun will still be shining, albeit as a narrow crescent, and that sunlight will be scattered and bent by refraction so that the light reaches into the moon's shadow. That weakened sunlight will then illuminate the sky all around the horizon. This effect somewhat resembles sunrise or sunset, but in every direction, instead of just east or west. Initially, just after totality begins, the darkest part of the sky will be toward the west-northwest, the direction from which the shadow is approaching; the brightest part of the sky will be toward the east-southeast, which is yet to become enveloped by the shadow. Near the end of totality, the situation will be reversed: the west-northwest sky will be rapidly brightening, while the east-southeast sky will appear darkest, because that is the direction toward which the shadow is rapidly retreating. Needless to say, with all of this scattered sunlight being bent into the moon's shadow, you should not expect the sky to get "as dark as a night under a bright full moon." You will not be disappointed if you do away with that expectation, however, because the overall darkness will still be quite striking. And the rapid drop in light levels, something akin to what you would normally see 30 or 40 minutes before sunrise or after sunset, will certainly be startling. (That drop off in illumination — from daylight to twilight — takes only about 30 seconds just before the moon completely covers the sun and totality begins.) It simply will not be the same as a moonlit night. But, certainly, it will be dark enough for you to see the brighter stars and planets. Joe Rao serves as an instructor and guest lecturer at New York's Hayden Planetarium. He writes about astronomy for Natural History magazine, the Farmers' Almanac and other publications, and he is also an on-camera meteorologist for Fios1 News in Rye Brook, N.Y.